Content marketing is growing up. According to “Quarterly Intelligence Briefing: Digital Trends for 2013,” content marketing became the number one priority for marketers in 2013. And why not? But if content marketing is ultimately meant to drive interest in your products, the irony is that any given piece of content is best thought of as a product in itself: you’ve got to determine if there’s a market for your content, and then create and distribute it, just as you do with your products. 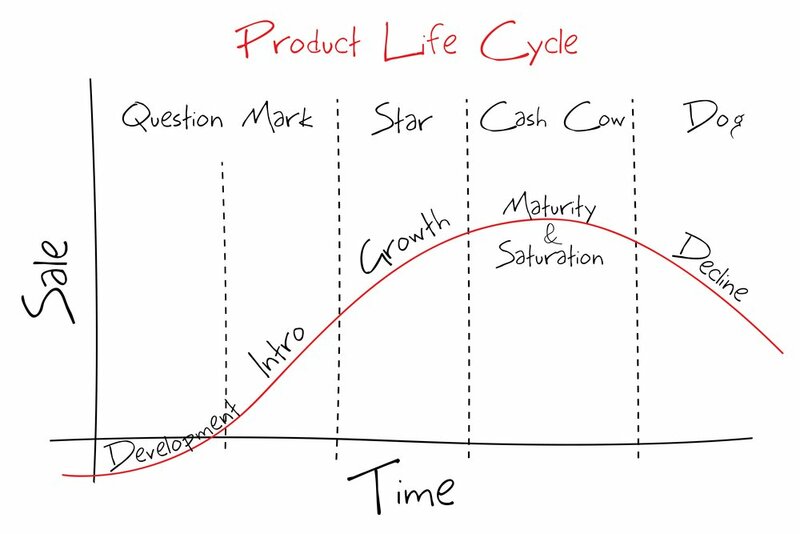 This means that we can learn a lot about content marketing simply by looking at how the product life cycle works. 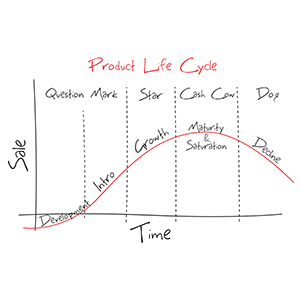 If you’re new to the term, “product life cycle” (PLC) refers to the stages a product goes through, from beginning to end. It’s a rise and fall story, that, if all goes well, will lead to a lot of profit before the journey is over. Let’s take a closer look at the different stages of the cycle to uncover the lessons for content marketers. The PLC begins with the often difficult “introduction.” During this stage, the assumption is that returns will be negative. You’ve just spent a ton of money developing your product, and now you’ve got to spend even more to get the word out. Think, for example, of how many marketing dollars Kellogg’s will spend to introduce a new breakfast cereal in the hope that it will eventually catch on. In most cases, a piece of content will have to go through a gradual introduction stage as well. You will have spent a lot of time (and sometimes a lot of money) to create the content, but now you’ve got to find a way to get it out into the world. And merely posting it on your social networks won’t be enough in most cases. As with the PLC, your returns are negative at this stage. In fact, a new piece of content will generally face more competition than a new product, so this stage can be especially tough for content marketers. Take the example of our “Guide to Twitter’s Tailored Audiences.” Even if your guide is entirely unique, it will have to compete against every other piece of content that touches on Twitter and marketing. And there is no shortage of such content – trust me. The good news: this stage doesn’t last long. Usually in a matter of days, if not hours, content marketers will pick up signals from “innovators” (or well-informed readers) that will reveal how their content is performing. The growth stage is critical in the life cycle of all successful products, and the same can be said for a successful piece of content. At this point, content marketers can see whether a given piece of content is gaining traction. “Early adopters” (or educated opinion leaders) will start sharing the content with their networks. When you see the tweet promoting your content retweeted by an industry expert with a large following, you know the growth stage has started and that it’s time to own the content and invest in distribution. If we use the example of the Twitter Tailored Audiences guide, it’s likely time to run display ads on websites that specialize in social media advertising or to to run sponsored stories on LinkedIn as soon as you see the retweet. Because you’re still spending on distribution at this stage, your returns will likely still be negative during the growth stage. But you won’t mind spending because now you can see that customers are arriving at your site to download the guide. Sales, meanwhile, are starting to give you some positive feedback on your leads. If your product or content has made it this far, you can finally start to enjoy the fruits of your labor. In the Kellogg’s example, your new cereal has become a household name, and you can count on significant sales through name recognition and brand/product loyalty alone. When it comes to the content cycle, the maturity stage is when you know your content has been consumed and shared by “early and late majority” adopters. This means that your mainstream readers are seeing and sharing your content. Typically, you’ll stop running advertising and rely on the network effect on social media. In the case of the Twitter Tailored Audiences guide, you’re now seeing a steady flow of customers coming to your site and downloading your report. Your may reach a point where you can almost predict how many visitors/downloads you will see from your content. You are also staring to see revenue on the leads generated from the content. At this point, you are now breaking even on your investments. In the PLC, the decline stage can be painful. The Kellogg’s cereal has been around so long that kids now associate it with their parents and there are two generic rip-offs sitting right next to it on the supermarket shelf — not to mention the General Mills product that is nearly identical. In other words, the competition has caught up and the market has become saturated. This is true, to some extent, with content marketing as well. But, unlike a product, a piece of content doesn’t have to die. Sure, you’ve already reached much of your target audience. And, sure, Google favors fresh content. But that doesn’t mean that your older content can’t perform. At Chango, we have a three-year-old story on Moz that’s still driving qualified leads every day. Many companies have figured out that they can delay the decline stage by adding new features to old products, and the same is sometimes true for content. Updating articles with new information can be a great way to make sure that you’re squeezing the most out of your content. Not all the parallels are perfect here, but content marketers have plenty of lessons to learn form the product life cycle. And now is the time to learn those lessons because content marketing itself is still very much in the growth stage.